A video showcasing 70 Years of research at NASA’s Armstrong Flight Research Center in Edwards, California, began airing on NASA television Sept. 26. Armstrong, the agency’s lead center for atmospheric flight research operations, began its storied history in the high desert in September 1946. Initially focused on experimental aircraft called X-planes, flight research with the X-15 rocket plane offered the opportunity to assist with the space mission of NASA. 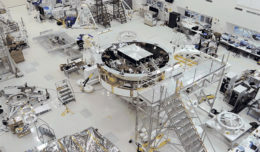 The following decades saw Armstrong’s mission expanded to include roles in the space shuttle program, aviation safety, airborne science and technology advancement. In addition, a NASA 747SP aircraft based at the center carries the world’s largest airborne infrared telescope named SOFIA, Stratospheric Observatory to Infrared Astronomy. Armstrong is returning to the age of X-planes with NASA’s first electric propulsion aircraft, named the X-57. That aircraft could lead to advances in fuel efficiency and reductions in noise and emissions. In addition, Seventy years after coming to this desert outpost to test the first X-plane to reach flight supersonically, the center is pursuing research that could lead to another fast but quieter X-plane. If successful, that aircraft could substantially decrease the noise made when an aircraft pierces the speed of sound that could end the prohibition on supersonic flight over land. NASA TV schedules are available at: http://www.nasa.gov/ntv; You Tube: www.youtube.com/armstrongtv; For more about Armstrong Flight Research Center, visit http://www.nasa.gov/centers/armstrong.